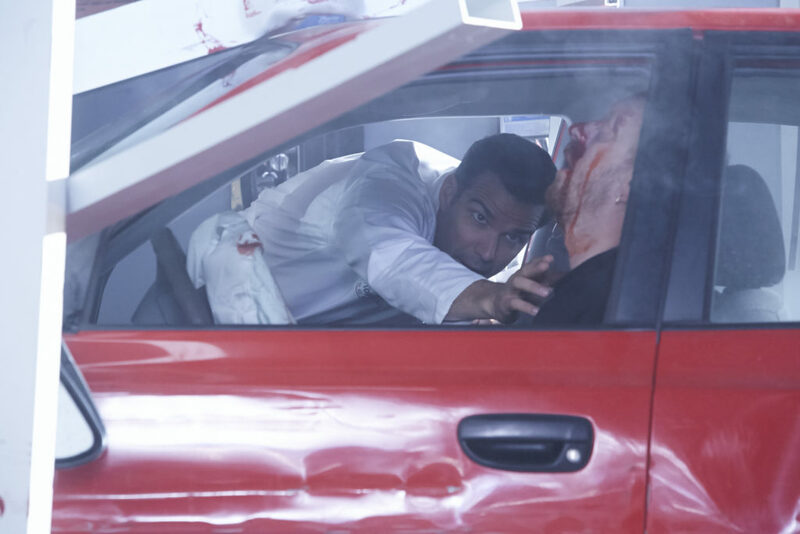 CTV has released a synopsis and images for Saving Hope’s 7th episode entitled “Gutted”. Remember in the last episode that Alex and Maggie’s surgery resulted in Bree falling into a coma? Well in the next episode we learn there were consequences to it that involves Kristin Lehman’s character. We also saw Zach quit Hope-Zion but from the images and description, we see he is still in the ER turned urgent care facility and having to deal with a real emergency. Following surgical complications with their cancer study patient, Dr. Alex Reid (Erica Durance) and Dr. Maggie Lin (Julia Taylor Ross) find themselves dealing with a tough, no-nonsense lawyer. Meanwhile, Dr. Zach Miller’s (Benjamin Ayres) emergency room has finally transitioned into an urgent care facility, with all serious trauma injuries being rerouted to other hospitals. But when a car crashes into the ambulance bay, Zach and his trauma team are ill-equipped to treat a man who’s been pinned between the car and a wall.